The legendary ship, “George Averof” is beloved by all – something which she has earned in her years of service in the Hellenic Navy. 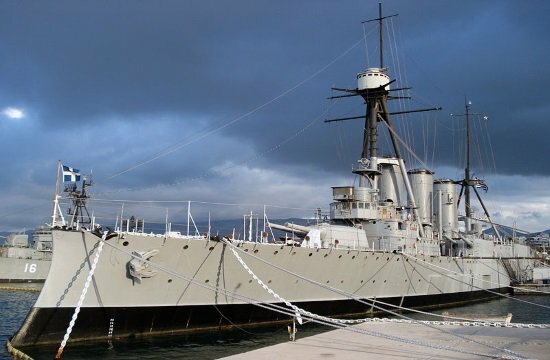 It’s been 65 years since the ship was decommissioned, and she has served as a floating Naval museum in the bay of Palaio Faliro just south of Athens since 1984. She may be out of commission, but recently the famous Greek shipowner Alexandros Goulandris along with members of Hydra’s Ecologists Club and retired Naval officers have decided to come together and revive the old ship to see her sail the Greek seas again. It has been awhile since “George Averof,” also known as “Lucky Uncle George” has sailed the seas. Back in the 40’s she made a name for herself and her crew who defied the threat of German airstrikes as she made her way to Souda Bay, Crete. “George Averof” went on to patrol the Indian Ocean and remained in commission until 1952. Now Alexandros Goulandris, known for his philanthropy in all things Hellenic – especially maritime tradition – has taken on the task of reviving the old ship. It is a daunting task, as she has been anchored for decades and, being a 110 year-old cruiser, she has a lot of mechanical work that must be completed before she can ever sail the seas of Greece again.